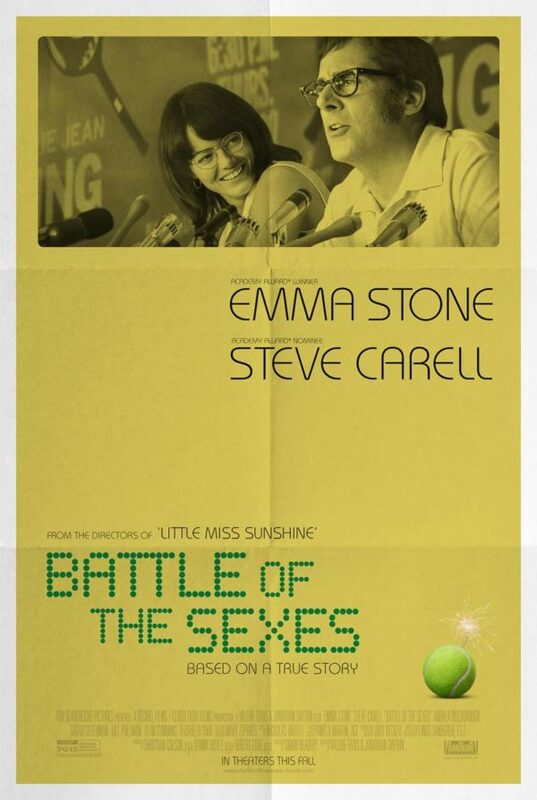 The true story of the 1973 tennis match between World Number One Billie Jean King (Emma Stone) and ex-champ Bobby Riggs (Steve Carell). What’s really interesting about Battle of the Sexes is that it’s main focus isn’t just the tennis match between Billie Jean King and Bobby Riggs but how society was in the 1970’s in relation to the women’s movement and how King and Gladys Heldman (Sarah Silverman) set up their own women’s tennis tournament. This allows you to really see where King was coming from, what obstacles she and other female tennis players were facing, and how hard she fought for respect from her male peers. This helps you realise how difficult a decision it was for King to take up Riggs on his offer, as the weight of people’s expectations were on her shoulders. This build up to the big match also gives time to Riggs side of the story, showing his more human-side and how he may not believe all the chauvinist stuff he says but rather says it for a reaction. Everyone gives compelling performances in Battle of the Sexes. Emma Stone does a great job in portraying the inner conflict in King as she finds herself attracted to hairdresser Marilyn Barnett (Andrea Riseborough) while still caring for her husband Larry (Austin Stowell). Carell is hilarious as Riggs, but you also get to see his vulnerabilities that comes with being a gambling addict. Battle of the Sexes has snappy dialogue, compelling characters and is a lot of fun. It balances the drama with the comedy and when you finally see the match between King and Riggs, it’s a thrilling showdown between two larger than life people. Battle of the Sexes is a great film with an important message and themes and it’s so unfortunate that those themes of equal rights and opportunities between the sexes is still so prevalent over 40 years later. 4/5. I love Roger Federer and Rafa Nadal. They are two of the greatest tennis players who have ever lived and they are my favourite players. I am one of those people who likes and supports both of them, no matter who they are playing. When they end up playing each other I’m often torn because I love them both and never really know who I want to win, but I do know their matches will be incredible. Theirs has been a rivalry that’s been going for thirteen years now. They’ve played each other 37 times so far, with Nadal leading with 23 wins to Federer’s 14 wins. Probably their most famous match is the Wimbledon 2008 final. It was pure magic and one of the first tennis matches I remember being riveted by, it was an example of phenomenal tennis. They’ve made each other improve their game and have set so many records individually and together. They’ve each had their problems and injuries and for them to come back in 2017, with Federer 36 years old and Nadal 31, and win the four major Grand Slams between them is incredible. This year Federer won Wimbledon for a record eighth time, and met Nadal in the Australian Open where he won in five sets. While Nadal won the US Open and he won his tenth French Open title (another record) and firmly cemented himself as the King of Clay. 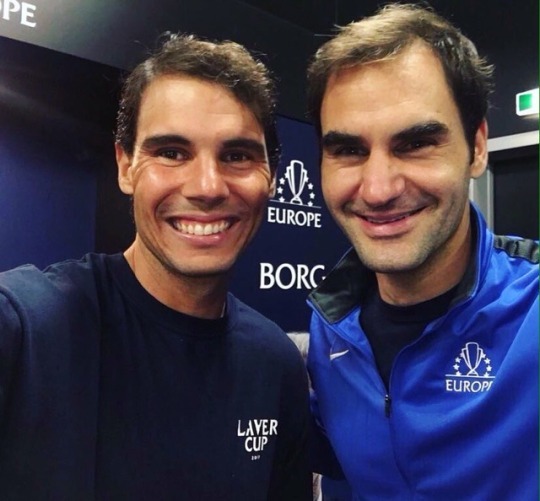 Last month was the inaugural Laver Cup, a tournament organised by Roger Federer in the style of golf’s Ryder Cup, with Team Europe playing against Team World. It was an event that had its critics before it started as it doesn’t affects any players standings and was seen as more of an exhibition tournament more than something players want to win. Doubters were proved wrong as everyone involved was desperate to play their best and to win. 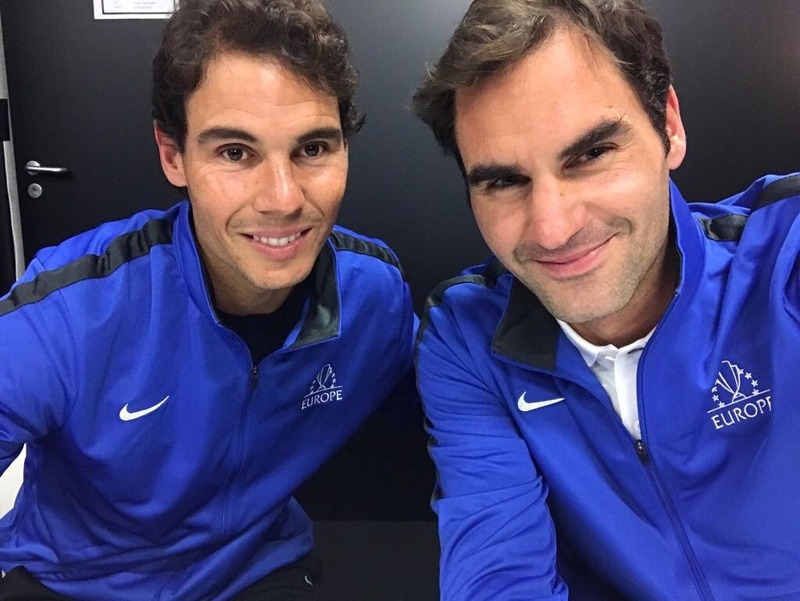 One of the highlights of the tournament was that Federer and Nadal, both playing for Team Europe, played a doubles match on the same time – the first time they’ve ever played together like that. It was a thrilling match and their opponents from Team World, Sam Querrey and Jack Sock, put up a fight, especially in the second set but Nadal and Federer went on to win the match, even if there were some slight mishaps where they were unused to playing together. Team Europe went on to win the tournament after Roger Federer defeated Nick Kyrgios, when in his excitement Rafa went and jumped into Roger’s arms! The Laver Cup really highlighted how these two sportsmen not only respect each other, but how well they get along off the court. They are some of the fiercest rivals in sport ever but they have also become almost friends. It was wonderful seeing them on the same side, supporting each other and the younger players on the team. To be honest I don’t think I’d ever seen Rafa smile and laugh as much as he did that weakened, especially whenever he was with Roger. It was such a great tournament – and being able to watch their doubles match live was the best £6.99 I’ve ever spent (I got a Sky Sports 24 Hours Pass on Now TV). They are both getting older, and they will have to retire at some point, but until then I’ll enjoy watching them play – both against one another, and against anyone else. I could write even more about Rafa and Roger and why I like them so much, but really it can be narrowed down to two things that applies to them both. 1. They are very talented tennis players and 2. They seem like generally nice, charismatic people. I could say so much about them, using their own quotes to describe each other, but I don’t want this post to be even longer than it already is. I love them both and I’ll finish this post with a video from the Laver Cup someone highlighting Federer and Nadal’s friendship. Though I also have to mention this video, where Roger and Rafa are supposed to be filming an advert for a charity match and they cannot stop laughing – if I’m ever feeling down I watch this video and it always makes me feel better. 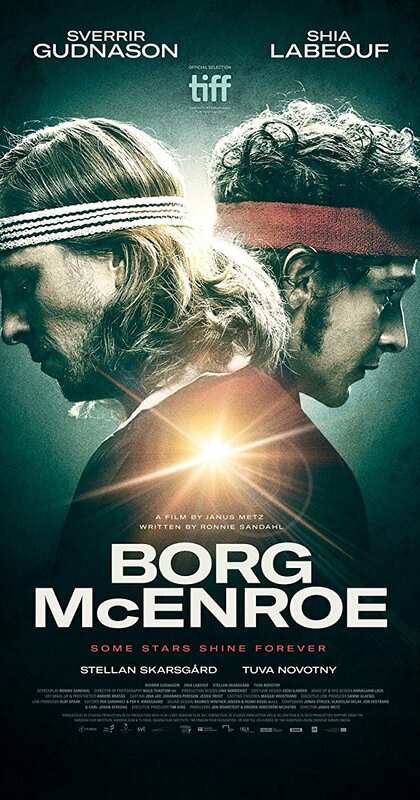 The story of the rivalry between the enigmatic Björn Borg (Sverrir Gudnason) and the brash John McEnroe (Shia LaBeouf) with a focus on the 1980 Wimbledon Championship. Borg vs McEnroe is a great insight into two legends of tennis. It’s a bit uneven in the time spent with each man, with more of a focus on Borg which is a bit of a double-edged sword. It’s a good thing because out of the two he is generally the one who is more private and less is known about him so seeing him as a child and teenager shows how he became the champion in was in the 1980’s. but on the other hand, every time the focus shifts to McEnroe, the screen crackles with energy and that’s down to LaBeouf’s near perfect performance. LaBeouf as McEnroe really was the highlight of the film for me but it was interesting to learn more about Borg and his relationship with his coach Lennart Bergelin (Stellan Skarsgård) and his fiancé Mariana Simionescu (Tuva Novoyny). All give good performances but Shia LaBeouf is the one who really shines. All the tennis matches featured in Borg vs McEnroe are well-shot and exciting but it’s the 1980 Wimbledon Final between the two men that is truly thrilling. With the music building as each set progresses, the editing and the performances of the two leads it makes the final showdown between these two legends incredibly tense and exhilarating. Everything in Borg vs McEnroe has been building to this moment and it doesn’t disappoint. The costuming, the music, the sets, everything is so incredibly 80’s and it all looks great. Borg vs McEnroe is a great, though slightly uneven, sports film. If you’re a tennis fan you may get more out of it but it’s themes of rivalries and underdogs are for everyone. 4/5.